Words: Traditional Polish carol, "W Zlobie Lezy", translated to English by Edith Margaret Gellibrand Reed (1885-1933), 1920. Source: Source: "Primary Education: A Monthly Journal for Primary Teachers"
Published by The Primary Education Company, Boston (et. al), 1920. Music: "W Zlobie Lezy," Polish carol; arranged by Edith M. G. Reed, 1920. Lying cradled in a stall. That the Babe is Lord of All. In the fields their vigil true. Which should bless the world anew. That the Babe is born for you. Sheet Music from "Primary Education," December, 1920, p. 641. The earliest known version of this Polish folk carol was published in December, 1920, a discovery that was made by a friend of this site, David Newman, editor of Art Song Central, who wrote on Dec. 5, 2010. Previously, it was thought that this translation was first published in 1921 or 1925. The lyrics and music are printed in numerous hymnals. Ms. Reed was born in London, March 31, 1885. She was educated at Clifton High School, St. Leonard's School, St. Andrews and the Guildhall School of Music, London. An Associated at the Royal College of Organists, she assisted Percy Scholes in editorial work. During World War I, she edited The Music Student, Music and Youth, and Panpipes, and continued as editor of the latter two after the end of the war. She traveled widely, was devoted to athletics and outdoor life, wrote two Christmas mystery plans, and authored Story Lives of the Great Composers. She died in London, June 4, 1933. In a blog dated March 6, 2009, Katya in Maine (a.k.a. "Physics Chick") wrote that that "...the final notes are generally sung wrong in English. 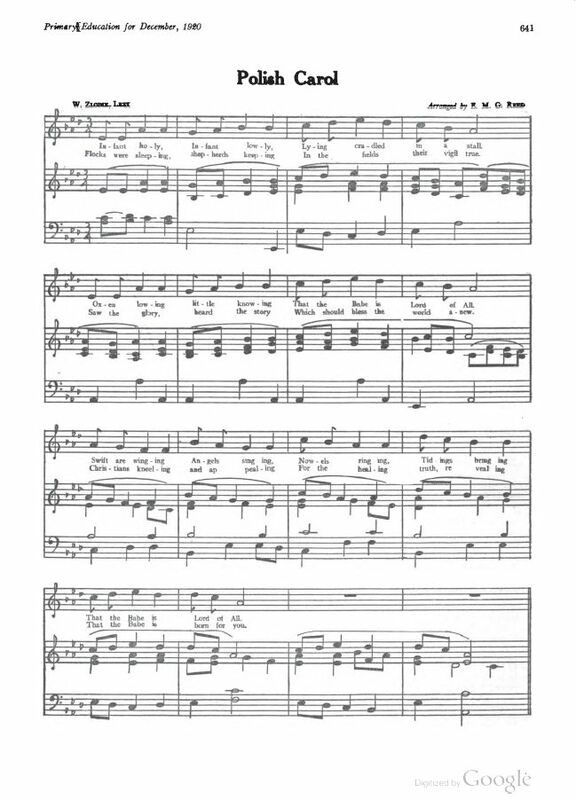 Due to an early misprint, the last three notes are often sung F-D-C (where the song is in the key of C), but they should actually be sung E-D-C." See Christmas carols: Infant holy <accessed March 12, 2009>. Katya has also imbedded several videos of choirs singing this carol, both in Polish and in English. Check it out! David, however, has another take on the score. He wrote: "It is also worth noting that the melodic "error" noted in some early editions appears to have been a deliberate choice by Miss Reed. (There is, however, a clear error in the accompaniment of the first line... measure 3 should look like measure 13.)" Note that the MIDI and Noteworthy Composer settings, above, were based on another version of the setting to this carol. My thanks to David for his thoughtfulness in sharing this valuable information concerning the origin of this translation. Thanks, also, to Katya for her work in locating and imbedding videos of this carol being sung by several different carols.